Many game developers are rushing towards mobile phones as a place to release their games. Nintendo, however, has preferred to stick close to its own gaming hardware. Which is why it's so odd that Nintendo characters appeared at this mobile phone booth at the recent China Joy gaming expo. China Mobile, China's largest telecommunications carrier, is huge. As of June of this year, China Mobile has over 790 million subscribers. That's more than double the entire population of the United States. When Kotaku approached China Mobile at China Joy about their use of these Nintendo characters, the booth staff called over the booth supervisor, who, in turn, assured Kotaku that China Mobile, through their various app developing and publishing partners, had received the go ahead to use the characters in their promotional material for their 4G app store platform. Nintendo actually already has a presence in China through their iQue joint venture, which is now a wholly owned subsidiary: Nintendo sells 3DS consoles and various other products through the iQue brand. iQue's Chinese name is 神遊 (shen you), meaning Godly Journey or God of Games, which is an aptly fitting title for a Nintendo company. Nintendo, through iQue, has been selling games in China since 2006. So why are these Nintendo characters at a mobile phone booth? Is Nintendo planning on releasing its games (or just characters) on Chinese mobile phones? 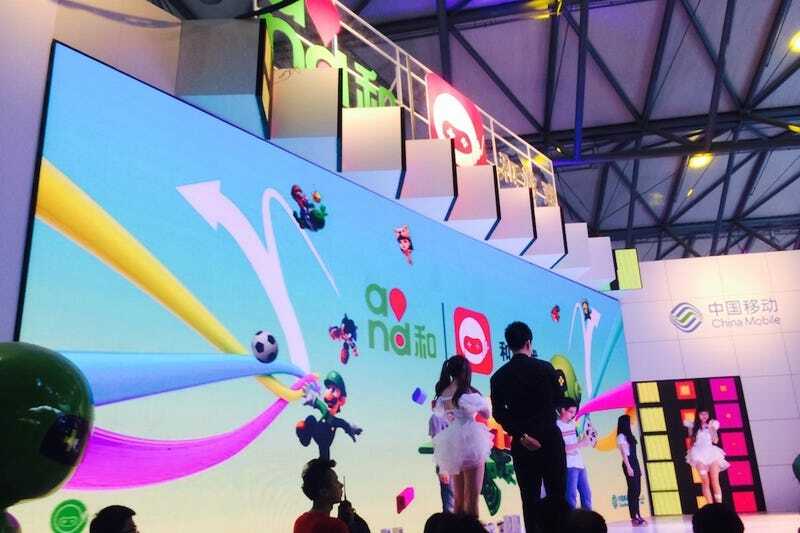 Did someone put Mario, Luigi and Yoshi (and, uh, Sonic from Sega) on China Mobile marketing by accident? Considering how Nintendo hasn't exactly been pursuing smartphones aggressively, the use is all the more peculiar. Kotaku has reached out to Nintendo for comment and will update the story accordingly. Update: Nintendo tells Kotaku, "Nintendo has not licensed the use of our characters in this instance."